WORLDWIDE: Consolidating market draws breath before the next big step into 10MW-plus waters. The most powerful offshore turbine combines incremental and innovative solutions, and features the largest rotor currently operational. The upgrade to 9.5MW announced in June has attracted substantial interest from developers, with a potential order intake of more than 250 units. Retained technology features include a trend-setting tube shaped medium-speed drivetrain with flanged connections between all drivetrain components. The load-carrying main shaft housing is the only main element structurally attached to a cast main chassis, which in turn is integrated with a three-dimensional mass-optimised lattice-steel rear structure. The design modifications were generally minor and, according to MHI Vestas, did not alter the turbine's main dimensions. Some gearbox strengthening due to the 19% higher rated input torque did not impact outer drivetrain dimensions and mass. Also upgraded were the electrical system, and the rooftop cooler for gearbox, generator hydraulics, and rectifier, without having to enlarge total cooler size. The V164-9.5MW's business case focuses on reducing wind-project LCOE. A bigger rotor would boost AEP, but raises turbine loads and hub height would have to be increased to retain minimum wave clearance, raising substructure costs. Fewer V164-9.5MW turbines for a given high-wind project result in a modest AEP penalty, but allows removing substructure, cables and installation costs, while Capex and Opex remain largely unchanged. 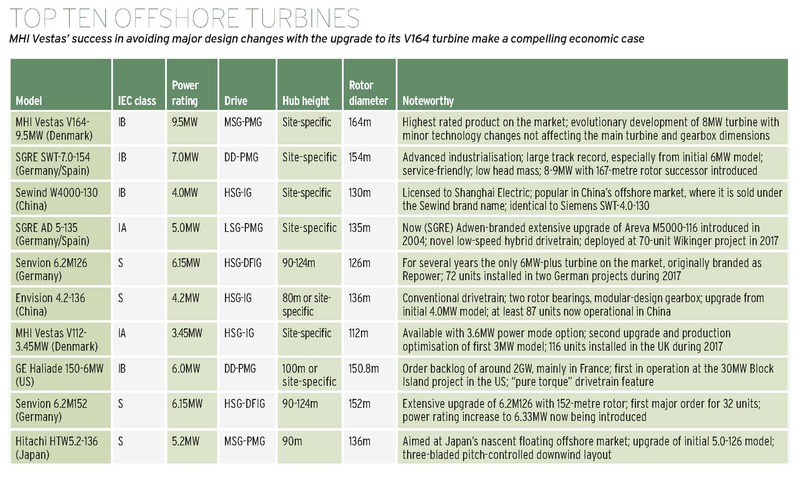 The direct-drive 7.0-154 is an evolution of the 6MW turbine introduced in 2012, retaining the 154-metre rotor. It incorporates a novel in-house outer-rotor PMG and a spacious cylindrical-shape nacelle with easy internal service-hub access provided via a hollow generator shaft and single rotor bearing. Two individual power-electronic converters are located inside the nacelle, and a 33kV or 66kV medium-voltage transformer in a separate component below and behind the tower. The 7.0-154 retains a favourable head mass of around 360 tonnes. It successor, the SG-8.0-167 DD was announced in late November 2017. The SWT-7.0-154 DD enjoys a huge order backlog, and an advanced mature supply chain with a new blade manufacturing plant in Hull in the UK, and a nacelle facility in Germany's Cuxhaven. The Sewind W4000-130 is licensed from SGRE. A prototype was installed in 2012 with series production ramping up in 2015. A proven, high-speed geared design, evolved from the 3.6MW turbine that dominated the offshore market until the introduction of 6MW, 7MW and 8MW designs, it features a non-integrated geared drivetrain with four-point gearbox support and induction generator, and with IEC1B specs. This high-wind design has been selected for many low-wind (typhoon-prone) projects in Chinese waters. 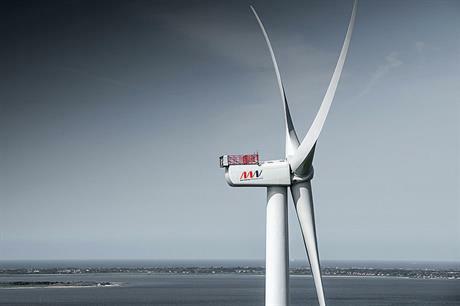 Its 4MW rating and 130-metre rotor diameter offer a favourable 302W/m2 in these conditions.